As you enter Hotel Monte Mulini, the panoramic view of the blue sea and sky spanning from almost every part of the hotel will leave you with a feeling of much-needed peace and rejuvenation. Indulge yourself and your body with one of our treatments based on the elements of water, stone, wood, and gold. If you are looking for a unique experience, we recommend the Chef’s table, Gin library, Yoga SUP, or simply a cocktail at the Mulini beach bar with the most beautiful view of the sunset. All of the 113 rooms and suites of Monte Mulini successfully combine natural materials and comfort with awe-inspiring views. Relax and calm the mind, spirit and body, with treatments based on natural and healing ingredients. Art Wellness is our lifestyle brand envisaged as a fusion of Mediterranean ambiance and elements of nature: water, wood, stone and gold. Enjoy our Spa & Wellness treatments at Hotel Monte Mulini in Rovinj. 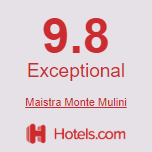 Presided over by our head chef and team of sommeliers, Maistra invites you to our boutique Hotel Monte Mulini which is rapidly making a name for itself as a fine-dining destination, unsurpassed in the region. Monte Mulini sits on top of a small hill, a 15 minute walk from the city centre of Rovinj in Istria, Croatia and only a minute away from the sea, in the lush natural surroundings of Punta Corrente Park Forest.